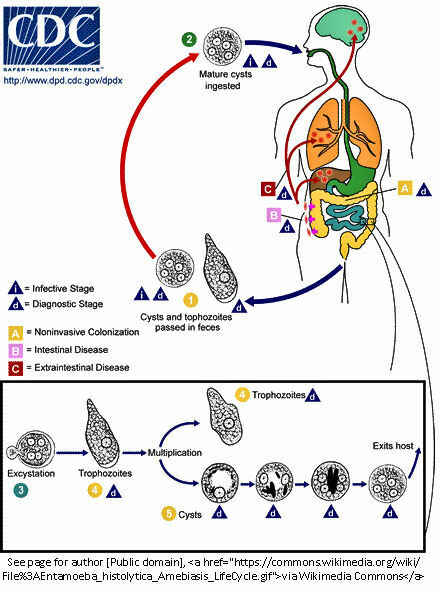 Amoebiasis or Amoebic dysentery is caused by the unicellular parasite Entamoeba histolytica. When the parasite enters the intestine it causes diarrhea, at times with fresh blood, and the body gets weaker. This condition may last several weeks. At times this parasite gets into the blood stream and may cause serious extra-intestinal amoebiasis affecting the liver, often manifesting fever and pain roughly where the liver is. ‘People at higher risk for severe disease are those who are pregnant, immunocompromised, or receiving corticosteroids’, according to CDC. The cysts of this parasite are found in the feces of the patient. Amoebiasis infection takes place when these cysts contaminate drinking water and food directly or indirectly. Physical contact with a patient, too, can cause infection when the cyst gets transferred to the mouth. Even edible items grown in soil contaminated by infected feces can spread the disease. Strictly follow personal hygiene and also take all the precautions listed in this website for Cholera. Homosexuality in men is said to be a risk factor for contracting this disease according to the Journal of Royal Society and Conservapedia.